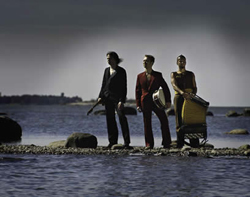 A new ensemble featuring three music-veterans (Kimmo Pohjonen - accordion, Sami Kuoppamäki - drums, Timo Kämäräinen - guitars) which explores new musical paths. You can expect pretty much anything, from Jazz-like rather "mathematical" approaches, Electronic and feedback-looping experiments, single and group improvisations reaching from "classic" Rock to rough Metal/Noise attacks (as witnessed at Helsinki´s Tavastia Club). A Must-See, more information here. And here a video! Thanks to our new cooperation with stalkermusic.com we are able to present a video interview with the Finnish Rock band Kaihoro . Vocalist Markku Pihlaja and guitarist Harri Pikka tell pretty much everything about the band.